It is a common misconception that only the rich and famous are at risk from electronic bugs invading their privacy. The truth, however, is that anyone could be affected, for any number of reasons. Read on to see why you could be among those in need of bug sweeping services. The number one reason why individuals and companies find themselves the victims of listening devices and hidden cameras is money. By watching or listening, the individual behind the devices is hoping to make money from what they see or hear. This could take many forms. When it comes to individuals in their own homes, it is often a precursor to a planned robbery. Blackmail or bribery also tend to be among the main reasons for the installation of surveillance devices. The perpetrator hopes to be able to gather evidence of illegal or immoral acts that they can use to extract money from the victim. Of course, this is also occasionally the case with businesses too, but more businesses find that the devices found during bug sweeping are there in the hope of picking up information that can be used by their competitor to increase their market share. This could be anything from finding out bid amounts for contracts to formulas for new products. Aside from money, other reasons include personal gratification, revenge, and power. Individuals can be at risk from jealous partners, ex-partners or overzealous family and friends. When it comes to businesses, ex-employees are often the main perpetrators, particularly if they left the company under less than great circumstances. 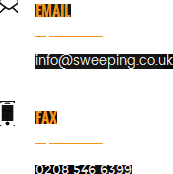 More people than you first realise are in need of counter surveillance support from companies such as Advanced Sweeping. We provide bug sweeping services that are second to none. If you think you fall into one of the categories above, don’t hesitate to call us on 0845 512 1552, or for more details on what we do, visit http://sweeping.co.uk/.